Arlington Heights Fire Department Ambulance 4 heading to Northwest Community Hospital with a patient from an SUV crash (more photos). 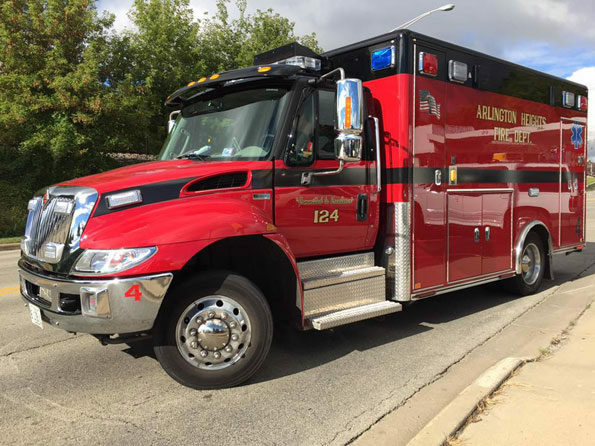 Arlington Heights police and firefighter/paramedics responded about 9:22 AM Wednesday to a report of crash with injuries at 406 East Northwest Highway Arlington Heights, Il. Police and firefighter/paramedics initially received a report that a driver was trapped in an SUV that hit a parked car on Northwest Highway at Grandt’s Shell. Witnesses said the driver still had his foot on the accelerator with the engine revving after his SUV crashed into a parked car. Mechanics from Grandt’s Auto Repair came to the driver’s aid until firefighter/paramedics arrived. The driver possibly had a medical issue before his SUV, traveling on eastbound Northwest Highway, crossed into oncoming lanes and crashed into a parked car on the opposite side of the road. The driver was transported to Northwest Community Hospital. No gas pumps were hit, and the gas station and auto repair center continued full business operations.